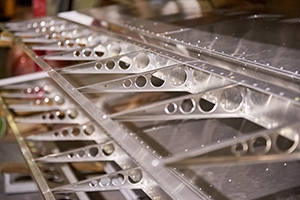 NC Spar Mill Operators machine close tolerance, high quality spars for aircraft assembly. A graduate NC Spar Mill Operator will have the knowledge of all facets of spar fabrication. An NC Spar Mill Operator apprentice receives training in all phases of conventional and NC/CNC milling machines, including skin and spar mills and layout, shot peen operations, hand work, heat treat, tank lines, assembly, prep, and spar handling processes.